A healthy, beautiful new smile in a single day! If your mouth is in a state of disrepair, you are embarrassed to smile and it’s painful to chew; or you currently wear dentures and are frustrated with adhesives and slippage, Dr. Padolsky has solutions for restoring your mouth to a healthy state. He can extract irreversibly damaged teeth, surgically place dental implant posts and provide you with functioning and natural-looking teeth in one day. Although remarkably expeditious, the procedure provides an effective, efficient and long-lasting solution for missing teeth. Dr. Padolsky takes advantage of available bone by placing as few as four implants (per arch) in strategic locations and angles. In some cases, he recommends six to eight implants per arch for additional stability. Beautiful, high quality restorations are subsequently attached to the implants permanently. 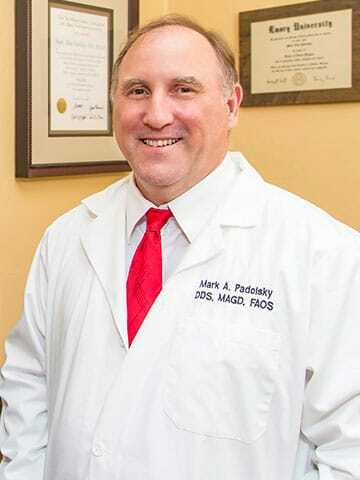 The procedure rarely requires bone grafts, and even patients who have severe bone loss as a result of years of missing teeth can benefit from Dr. Padolsky’s expertise in placing dental implants. Dr. Padolsky is truly a pioneer, and a leader, in dental implantology. He completed the very first course available in implantology (AAID Maxicourse) in 1987, and updated the course in 2002. His prestigious accomplishments include a Fellowship in the International Congress of Oral Implantologist, an Associate Fellowship in the American Academy of Implant Dentistry and the highest honor available to members of the American Academy of General Dentistry – the Mastership award. Dr. Padolsky has been providing dental implants since 1987, and successfully placed over 5,500 during his career. This equals experience and training you can trust! Implant-supported dentures eliminate the problems that are inherent to traditional dentures. With fixed dentures, there is no need for a palate that covers the roof of your mouth and interferes with your sense of taste. The individual teeth appear to naturally emerge from the gum, and your dentures don’t need to be removed for cleaning. A benefit that can’t be overemphasized is that dental implants help to deter or prevent the irreversible bone loss that occurs when teeth are missing. Jawbone requires stimulus to maintain density and regenerate naturally. Fixed, implant-supported dentures provide the necessary stimulus and keep your facial integrity intact. Fixed, implant-supported dentures provide far better chewing capacity than traditional dentures, allowing you to eat your favorite foods. You will be able to enjoy dining out, speak naturally and have a beautiful new smile. A CT scan is done to get a detailed 3D view of your teeth and jaw. Your first step toward a healthy, beautiful new smile is to meet with Dr. Padolsky to discuss your expectations. He will review your medical and dental history, take internal and external photographs, and take impressions of your mouth to create a study model. A healthy foundation of bone and tissue are vital to ensuring long-lasting, stable dental implants. Highly detailed images captured by our CT cone beamer scanner show Dr. Padolsky the quantity and quality of your existing bone, the position of your sinuses and provide detailed information about your teeth and gums. He uses this comprehensive information, in conjunction with 3D computer imaging and study models, to precisely plan the location, angle, dimension and length of your dental implants. You will meet with Dr. Padolsky to review the plan and approve the procedure. After Dr. Padolsky has fully planned your procedure, you will be scheduled back to the office. Any needed extractions will be done, the dental implants will be placed and you will get a brand new set of functional teeth all in the same day! Your quality of life and oral health will be greatly improved! 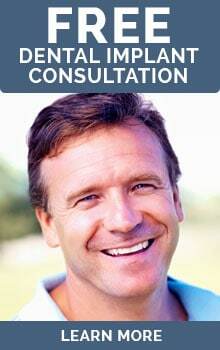 After the dental implants have fully healed, usually about 4 to 6 months, you will get your final teeth placed.